Bent handle design keeps material flat while cutting. Ergonomic SoftgripR handle for unmatched comfort control. 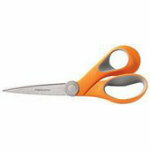 Hardened, stainless steel blades for lasting sharpness. Tested to ensure clean cutting to the tip even through multiple layers of fabric. First available April 2010.